Chef Sang Yoon—the godfather of LA’s gastropub scene—dishes on late-night drive-throughs, being called the Burger Nazi and (surprise!) ketchup in his fridge. "Every guy dreams of buying his favorite bar." 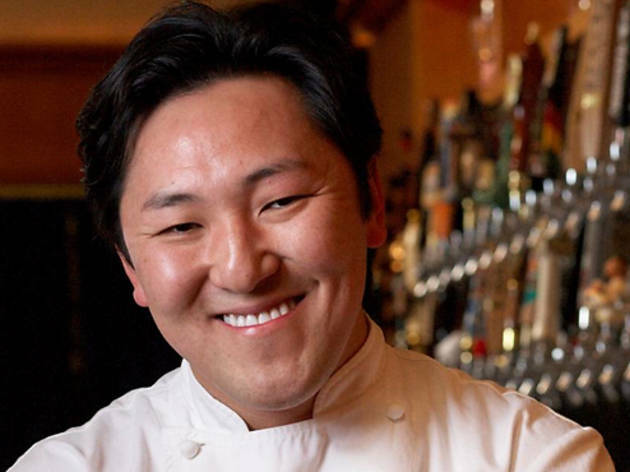 And that's just what Sang Yoon did when he took over his favorite go-to, after-hours watering hole, Father's Office, on Montana Avenue 12 years ago. Little did he know that he would spark a citywide gastropub craze and create a gourmet patty and bun that has become legendary. The 43-year old Brentwood resident has since opened another Father's Office in Culver City, next to his newest venture Lukshon, where he takes on Southeast Asian fine dining. 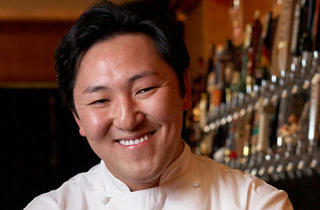 When he's not heating up the kitchen, the Seoul-born, LA-raised chef can be found pounding the ice. "I'm in a hockey league. I've been playing since I was a little kid, and I played in college" says Yoon, who still hits the rink about three times a week. "It's my main workout." Time Out LA: You have a strict 'no substitutions' policy at Father's Office. Do you ever get any ridiculous requests? Sang Yoon: All the time. There are so many we couldn't even get into it. I've been accused of discriminating against Jewish people, because there is bacon on the burger that we don't take off. But I grew up with a Bubby, a real Jewish grandmother, who only ate pork at Chinese restaurants, and she wouldn't take kindly to me being called the Burger Nazi. Serving bacon does not make you an anti-Semite, I don't know how else to explain that. What are your favorite late-night eats? My late night eats fall under two categories: really late and desperate—which invariably involves some kind of a drive-through, ordering through a speaker, which is so LA. Once in a while, I go to a restaurant in Thai Town called the Sanamluang cafe that's open until four in the morning. There's also Ruen Pair; and in K-town, there's Myung Dong Noodle House on Wilshire, a 24-hour noodle shop. Are there any hole-in-the-wall spots in LA that you love? The best ramen shop in my opinion is the Santouka Ramen in the Mitsuwa Market. If you go down Bundy all the way to Venice, there's a Japanese grocery store and inside its food court is Santouka, which is pretty well known out here. Their ramen is awesome, but a lot of people don't expect it to be inside a grocery store. Nothing. My breakfast is instant oatmeal with an egg cracked into it. I'm lazy and I don't want to dirty another pan, so that's how that dish was born!" Tell us two things in your fridge that would surprise people? Heinz ketchup. I don't serve ketchup in my restaurants, so people think that I hate ketchup, but I actually have it in my fridge. I also have five kinds of mustard. In most chef's home there's no food; there's just stuff to put on food.